bl.uk > Online Gallery Home	> Online exhibitions	> Asia, Pacific and Africa Collections	> Sonamerg. Photograph of Sonamarg in Jammu and Kashmir taken in the 1860s, from the Edward Molyneux Collection: 'Album of Indian Photographs'. This is a view of open ground looking towards the peak of Sonamarg and its glacier in the Himalayas. 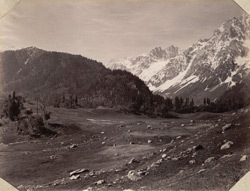 Inscribed in pencil on reverse of the print is the following note, 'Encamping ground at Sonamarg'.